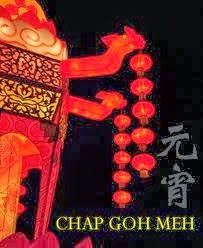 Chap Goh Mei is the last day or the 15th day of the Chinese New Year celebration. And it is also known as the Chinese Valentine Day where people throw apples/oranges into the river to find their other half. And Valentine is the western day of the day of love. So 14th February 2014 (today) is the time where both "Valentines" fall on the same day and only occurs every 12 years!! That is what my friend told me, I am too lazy to confirm this. Hence, there is alot of people registerring their marriages or having wedding bells today. Anyway, Happy CNY once again!! !